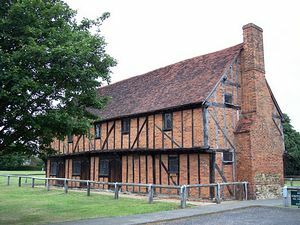 Elstow Moot Hall (or Green House as it was formerly known) was built in the late 15th century as a market-house in connection with the village fairs. It was used for storing the stalls and other equipment and as a place for hearing disputes arising from the fairs. In the 19th century the upper room was used both as a school and a place of worship. Restored by Bedfordshire County Council, Moot Hall is now a museum illustrating 17th century English life and tradition. The stump of a cross, damaged during the Reformation, marks the site on Elstow Green where the Annual May Fair used to be held. It was also on the green that John Bunyan danced and joined in games of tip-cat; a form of rounders played with a stick rather than a ball. Displays about local and Bedfordshire heritage from the County Archives can be seen. You can also visit the historic Elstow Abbey next door - famous for its connection to John Bunyan. Half a mile north of the A421/A6 junction. Follow the brown heritage signs 'Moot Hall and Elstow Abbey'.